GNHW member Norm Miner tries out the shooting board. He's left-handed, so he said he would make himself a left-handed shooting board. 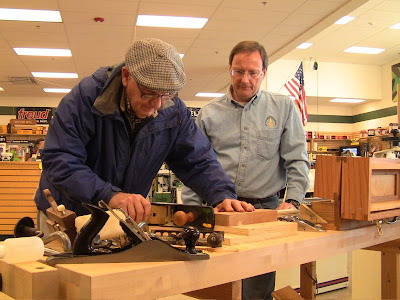 This past Saturday I spent several hours demonstrating hand tool techniques at the Portsmouth, NH Woodcraft store as a member of the Guild Of New Hampshire Woodworkers. The Guild is working on holding demonstrations there the 2nd Saturday of each month. Meanwhile, Assistant Manager Fred Chellis, also a GNHW member, was in back running a meeting of the Guild's Windsor Chair Subgroup. He carries on a long family tradition of chairmaking at Little River Windsors. I'll be back at the store on December 8th, noon to 3. I brought my portable toolbox with a full complement of tools, portable sharpening station, sawbench, sawhorse, bench appliances, and bin of practice lumber. Mark, the store manager, helped me set up one of their workbenches. I had also meant to bring my Queen Anne foot stool as a small example of a finished piece, but forgot to pack it in the van. Next time! I'll also bring my portable workbench as a tool table, because the main bench gets cluttered quickly. I was busy the whole time, from the first question asking how you saw straight, to Norm Miner pictured above trying out a shooting board. I also covered sharpening plane irons, chisels, and saws, and demonstrated various bench and specialty planes, including a quick bit of panel-raising. Several people said they were just developing an interest in learning how to work with hand tools. Since my goal at demonstrations is always to get people to try out the tools, I oriented the bench so I was working in front of it, rather than on the far side. That encourages people to step up to it when I step aside and offer the tools to them, bringing them into the workspace. That's what really convinces them they can do it. One of the things I emphasized was that hand tools allow you to work to incredible precision. That's how we got onto the shooting board, when someone asked about planing end grain. I showed them the beautiful fine sheets of pencil-sharpener shavings the plane takes off, then demonstrated the resulting flatness and squareness by standing the board up on its shot end and banging on the bench. The board didn't wobble a bit. If you're in the area December 8th, stop in and give things a try. I'm happy to demonstrate just about any procedure, from rough to fine work. I also encourage you to consider Guild membership (you don't have to live in New Hampshire). The cost is modest, yet provides access to a wide variety of area woodworkers, an equally wide variety of subgroup activities, and subscriptions to the excellent quarterly Journal.